In New York City, Molly Gunn (Brittany Murphy) is a spoiled wealthy immature young woman, living as if she were a princess in a fairy tale. Her father was a popular rock-and-roll guitar player, who died in a plane crash with Molly's mother when she was a little girl. On her birthday party in a nightclub, she meets Lorraine "Ray" Schleine (Dakota Fanning), a nasty young girl with attitudes of adult , living with her careless mother and a terminal father in a fancy uptown apartment. When the accountant of Molly vanishes with her US$ 100,000,000.00 inheritance, Molly is left with nothing but debts, and she needs to work to survive without having previous experience or any skills. She is hired to be Ray's babysitter, and their close contact makes Molly reach the maturity and Ray act like as a child of her age. 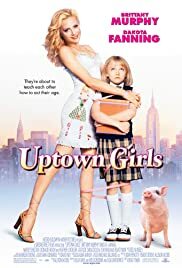 "Uptown Girls" has just a reasonable and predictable screenplay, being corny and boring sometimes, but supported by two of my favorite actresses: Brittany Murphy and Dakota Fanning. For me, they are the greatest attraction of this common flick and the reason why I bought the VHS. There are a few worthwhile moments along the story, the script has many flaws and this movie is only recommended to fans like me of these two great actresses. My vote is six.